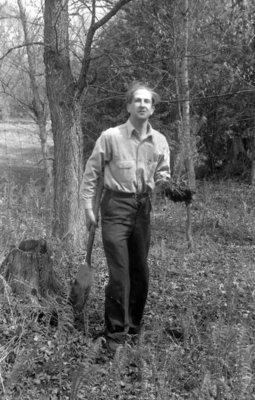 A black and white photograph of J.B. Beecroft standing by a tree in the summer of 1940. There is a shovel in his hand. Ruddy, Marjorie Georgina ; Beecroft, J.B.
J.B. Bancroft, 1940, Marjorie Ruddy. Whitby Archives A2013_040_087.